It’s hard to remember a product I’ve become so dependent on quicker than Gmail’s new Priority Inbox. I’m so addicted, that the few times I’ve accidentally clicked on the old “regular” Inbox view in the past week have really annoyed me. So much so that I actually moved that view into my “more” drop down (you can drag any sidebar item in there). And now I have good news: you can all share in this addiction. While it began rolling out to users on Monday, Google is now saying that Priority Inbox should be available to all users (including Google Apps users) today. Look for the “New! 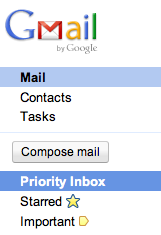 Priority Inbox” message in red in the top right corner of your Gmail account to activate it. There’s a slight learning curve with it, so you’ll still probably want to watch Google’s official video. But once you get started, it’s unlikely that you’ll go back. Overwhelmingly, the people I’ve talked to since the feature started rolling out on Monday are also now addicted to the feature. But some seem deadest against it, instead preferring to use their own filters to better tailor their mail consumption. I’m a big filter user myself, but I simply could no longer keep up with the amount of message coming into my inbox — I needed someone, or something to sort it for me. This isn’t a longterm solution for the email problem, but it will work for now.